On January 6, 1975, Nottingham Forest were thirteenth in the old Second Division, five points above the relegation places and straying dangerously close to establishing a permanent place for themselves among football's nowhere men. Within five years Brian Clough had turned an unfashionable and depressed club into the kings of Europe, beating everyone in their way and knocking Liverpool off their perch long before Sir Alex Ferguson and Manchester United had the same idea. This is the story of the epic five-year journey that saw Forest complete a real football miracle and Clough brilliantly restore his reputation after his infamous 44-day spell at Leeds United. Forest won the First Division championship, two League Cups and back-to-back European Cups and they did it, incredibly, with five of the players Clough inherited at a club that was trying to avoid relegation to the third tier of English football. I Believe In Miracles accompanies the critically-acclaimed documentary and DVD of the same name. 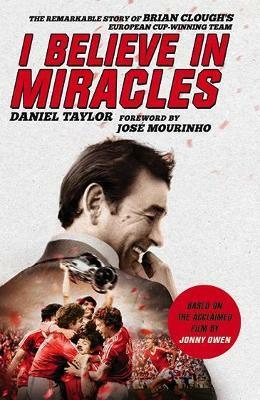 Based on exclusive interviews with virtually every member of the Forest team, it covers the greatest period in Clough's extraordinary life and brings together the stories of the unlikely assortment of free transfers, bargain buys, rogues, misfits and exceptionally gifted footballers who came together under the most charismatic manager there has ever been. Daniel Taylor grew up watching Nottingham Forest from the terraces of the City Ground before moving into the pressbox, and is currently the chief football writer for the Guardian and the Observer. This is his fourth book and his second on his specialist subject - Clough and Forest. Taylor grew up in Nottinghamshire and started his career at the Newark Advertiser. He was appointed by the Guardian in 2000 and now lives in Manchester. Jonny Owen was born and bred in Wales' most famous footballing town, Merthyr Tydfil. As well as acting in some of the UK's biggest TV shows and writing and starting in the Universal movie Svengali, he's also written about football for the Guardian, The Times and the the Western Mail. A little slower than he once was, he still trots out for a local five-a-side team and is currently working and living in Nottingham and London.